While we were on hiatus this summer, it seems the whole country, rather than taking time to go to the beach, the mountains, and Disneys both Land and World, went completely and totally insane. There was the Great Gay Chicken Debate dividing the nation on either side of the Culture War. And then there was the question of guns. We here on RSM have often touted the traditions of gun ownership and the teaching of proper gun handling (even though many of us don’t even own guns). But the events of this summer brought the gun debate front and center once again. In the early morning hours of July 17, a shooter opened fire in a bar in Tuscaloosa, injuring 17. Fortunately, none were killed. Only three days later, citizens of the Denver suburb of Aurora, Colorado, wouldn’t be so fortunate. A shooter walked into a movie theater screening The Dark Knight Rises and opened fire, killing 12 and wounding 58 others. Not since the Columbine shooting (also in a Denver suburb) and the DC-area sniper case had the nation been so rattled by gun violence. The public reaction was, sadly, predictable. The Left trumped out their standard cries of gun control. The Right reacted with their usual “from my cold, dead fingers” response. And then they took these typical positions even further. Those on the left seem to be trending further and further away from a more position of banning so-called assault weapons toward stripping away the right to own guns of any type. The Colorado shooter, to them, typified the problem with allowing the liberty of gun ownership to all. They are more than content to let the one bad apple spoil the whole barrel. Those on the right began to concoct elaborate conspiracy theories, suggesting that the Colorado shooter had been subjected to mind control experiments and was a type of Manchurian Candidate, programmed to exact mass casualties. The thought was that if the public was sufficiently horrified, they would beg the government to take their guns. And while these fears festered, gun and ammo sales went through the roof. The resulting debates over the nature of our 2nd Amendment liberties fell along predictable lines, too. The Left claimed the mandate for a “well regulated militia” is satisfied by the respective National Guards of the states. The Right emphasizes the “right of the people.” The Left says the framers couldn’t have imagined Uzis in a time of muzzle load muskets. The Right says arms are arms. Do we even deserve the Second Amendment anymore? When we turn a blind eye to the stripping away of our Constitutional liberties, so long as those who do the stripping agree with our positions on babies, gays and taxes, do we deserve to have those liberties at all? When our leaders lead not from principal, but by aiming for a moving target of morals for sale to the highest bidder and merely to score meaningless victories of political gamesmanship, shouldn’t we question our ability to even choose our governance? It is said that Nero fiddled while Rome burned. Are we any less guilty, watching Honey Boo-Boo while the Land of the Free becomes the Land of the Divided and Conquered? Liberties as monumental (and even to this day, controversial) as freedom of speech, freedom of religious expression, right to due process, freedom from illegal search and seizure and yes, even the right to bear arms are not for lazy citizens and fair-weather patriots. They are not for those who lack principle and vote only according the movements of their flock of choice. They are for those who would give everything – their comfort, their livelihood, their wellness, their lives – to breathe the rarified air of a free man. The truth of the framers intent for the Second Amendment, as in all things, likely lies somewhere between the two extremes. A well regulated militia is necessary for a free state. But what if that state militia is really under the thumb of an unjust federal government? The right of the people to keep and bear arms shall not be infringed, but what arms? Machine guns? Rocket launchers? Nuclear weapons? How do you regulate that which cannot be infringed? Maybe, just maybe the framers were deliberately vague. Maybe they wanted us to do some of the intellectual heavy lifting for ourselves. But if we cannot find a way to deal the widening divide between left and right, we deserve whatever we have coming to us. Wayne, writing on constitutional issues is not your strong suit, but I’ll give you a B- for the effort. With the Sandy Hook shootings, I can certainly can see why people believe gun control is the answer, but for a number of reasons it is not. Foremost, we have the second amendment and that sould be sufficient to end the discussion. There two different rights embedded in the second amendment: (1) the right of states to maintain a well-regulated militia should the state chose to do so, and (2) the right of citizens to purchase, keep and carry arms. One does not necessarily have to do with the other. 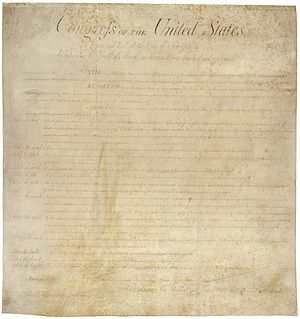 Firstly, this amendment gives the states the right to maintain a military organization to defend itself from subjugation by other states or the federal government should the occasion arise. Has nothing to do with the National Guard. Secondly, armed citizens are better able to defend their personal liberties from the state. So we have some check and balance here, both with deadly consequences. Believe me, if we had automatic weapons in colonial days, I can assure you patriots whould have clamored for them. You know, it used to be legal for citizens to possess cannon and governments from time to time would borrow the cannon to put down riots. Go figure. Now we debate endlessly what the constitutiona is suppose to mean; just read it. My point about the National Guard was not my own, but one I often hear argued from those opposed to personal gun ownership. The overall point of the post was not to debate the finer points of the 2nd amendment (which I do believe needs to be protected, despite the fact that I personally do not own guns), but to point out that we have become a lazy, complacent, entitled nation that needs to look deep within ourselves to determine if we truly value what we’ve been given in the Constitution and Bill of Rights. I’m not sure I want to know the answer.